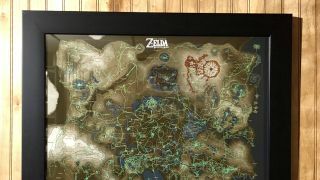 The Hero's Path DLC map feature in Zelda: Breath of the Wild offers a bird's eye view of your entire journey (well, up to 200 hours of it), and it can also make for some phenomenal wall art. With a couple hundred screenshots and a whole lot of patience, Reddit user kazoodac turned their Hero's Path into wall art that will forever remind them of the hundreds of hours they spent exploring Hyrule. Memories aside, it's also a great conversation starter for fellow Zelda fans: "So, judging by all zigzagging lines in the southeast corner, I'm guessing you had a little bit of trouble getting to Eventide Island?" Kazoodac used the Switch's built-in screenshot support and Photoshop's photomerge tool to assemble the image. The creative Zelda fan had to work in batches to avoid crashing Photoshop with the sheer quantity of screenshots, and there was a whole lot of "saving, cropping, merging, troubleshooting, and tweaking" before the final 16-by-20 inch, 300 DPI image was ready to print and frame. Thankfully, the end result (now hanging on the game room wall) appears to have been very much worth it. Hero's Path may not be as immediately cool as a motorcycle that breaks Breath of the Wild in the best ways possible, but it's proof that every journey through the game is unique, chiefly informed by curiosity rather than prescribed objectives. The similarities are remarkable, too - if you've played the game long enough, you too probably have a few tangled masses of green spaghetti on the Great Plateau and Hyrule Castle. Despite the differences, we can all relate to each others' stories in one way or another. What does your Hero's Path look like?